This CounterArt Anti-Fatigue floor mat will be your new best friend in the kitchen! Perfect for use in front of the sink or kitchen prep area, this mat features a memory foam core with a durable vinyl exterior and a gorgeous design that will brighten up any home. Form meets function with this gem, by reducing muscle fatigue when standing for long periods of time, while adding a decorative element to any room. If you prefer to stand at work rather than sit, this mat is perfect for the office, as well. Durable, and built to last, the CounterArt Anti-Fatigue floor mat measures 30 by 20 inches. 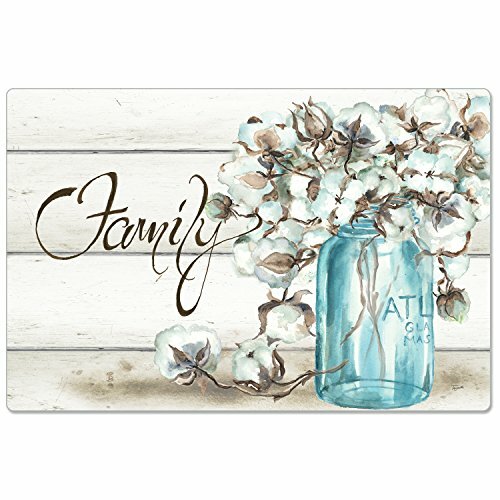 Look for additional coordinating kitchen products from our CounterArt collection, such as coasters, signs, place mats, trays and glass items in the same design to create a beautiful theme in your home.